When you walk on to the grounds of Fort Erie Race Track these days, you can almost see the ghosts. It’s a large, cavernous complex, but much of it is either relatively empty or closed off completely to the public. It’s obviously a place that has seen better, happier days, starting with Opening Day back in 1897. But no one can figure out how to restore the area to past glories. In fact, a chat with fellow visitors on a recent sunny fall Tuesday afternoon often focused on the past. Remember when you had to pay just to enter the area, and then pay extra to sit in the clubhouse? It’s all free now. Remember when the infield looked like a botanical garden? It is still better than most tracks, although it probably could use a little TLC these days. Remember when the grandstands were crowded? Now the upper grandstand area is gone, at least compared to the Seventies’ configuration, and most seats were empty on my visit. Remember when the horses were plentiful on the grounds? Tuesday’s card featured seven races, averaging about seven entries each. Apparently Fort Erie and Woodbine (the track in Toronto) are fighting over stable rights for the horses, so owners don’t bring the animals down the QEW for a race like they used to do. Fewer horses mean fewer betting combinations, fewer long shots, and smaller payouts. There were rows and rows of inactive betting machines during my visit, as well as a few places that sold beer and one concession stand that sold food. Apparently, the place is crowded one day a year – when the Prince of Wales Stakes is held – although certainly the crowds must be bigger in the summer than they are on a weekday in the fall. Despite the ghosts, the track is not an unpleasant place to visit. Everything seems to be run in a professional manner and it feels secure. The facility is relatively clean, and the workers are universally upbeat, helpful and friendly. Once upon a time, horse racing was one of the most popular sports in the country. It was about 45 years ago or so when the daily double result still was given on local television sportscasts. So, what went wrong? Plenty. Obviously, one of the major attractions of horse racing is the chance to gamble. It used to be one of the few ways to do it legally, but casinos, lotteries, etc. have changed all that. What’s more, someone has to put a little thought into a bet at the racetrack. It’s not as if you can pull a lever and win some money. As an industry, horse racing’s audience kept getting older, and thus smaller. Part of the problem was that the business didn’t embrace television when it had the chance, and that medium moved on to other things. The economics of horse racing also changed, as the breeding end of it became more and more of a way to earn money. That meant less racing, as the horses are too valuable to risk injury by running once they established a reputation as a winner. In other words, the stars usually disappear from the track sooner rather than later. And off-track betting made it easy to take a short drive to a parlor, make a wager on races at a major track, and watch on TV as opposed to driving to a race track. Locally, Fort Erie certainly took a small hit because of increased border security after 9/11. It’s become more of a pain to cross into Canada for the day, especially if you don’t have an enhanced driver’s license or passport handy. And the competition for the gambling dollar has increased greatly, with casinos setting up shop in Niagara Falls. According to statements on the track’s website, Fort Erie ran a surplus of $385,136 in its last fiscal year. However, that includes about a $7.9 million subsidy from the Alcohol and Gaming Commission of Ontario. The track keeps people in the horse racing industry employed, although it’s quite a change from the days when the money flowed out of the facility instead of into it. Starting in 1999, Fort Erie had slot machines open to the public. The idea, in part, was to make money that way in order to support the racing end of the complex. But the slots were dropped in 2012, as profits in such border locations across the province (also including Windsor and Sarnia) were way down. Will Fort Erie Race Track survive? We’re not sure. There is talk of a NASCAR-like track in the area, and Fort Erie’s owners reportedly are waiting to see if that happens before taking a big new step in some direction. But part of me thinks it would be a shame to end a 120-year tradition. There’s a certain romance that comes with the sport, with its early morning workouts, beautiful animals, and the characters in the stands. I’m rooting for the facility just across the Peace Bridge to find a way to continue operating. The cliché: The late Jim Kelley of The Buffalo News used to say that he loved to write about the Fort Erie Race Track, because he had the chance to use the phrase “picturesque border oval” in the story. Jim, this one’s for you. Cashing in: I stayed for five races, and placed one bet on each of them. Amazingly, I cashed four winning tickets – four straight show (second place) bets. My system was simple. I picked out a horse that looked like it could contend, thanks to some good speed ratings in the program. Three of the four won, and the fourth was a close second. I raked in about $5 on the day. Speaking of winning: I spent part of the afternoon with a group that included the father of one of the jockeys. Therefore, we were all happy when said jockey, Bradley Wilson, guided My Way Tapper to victory. It was the first of his two wins on the day. 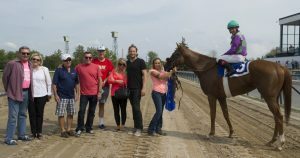 And it was really fun to go out on the track to pose for a photo with my new friend Brad, My Way Tapper, and the rest of the group. One tip to such visitors – watch where you step. Information: A program, filled with past performances of the entries, is $2.50 and is a must. You also might want to pick up a Daily Racing Form, which has similar charts and some predictions. There are plenty of symbols and numbers in both of them, so it helps to go with a friend who has an idea what they all mean. Otherwise, you may wind up betting on horses who look good in the post parade or who have a nice name. Horsing around: The best names for horses on this day were clearly Uswain Bolt and Of Horse I’ll Win. A story: Everyone around a race track has one. In my case, one time I made a rare exotic bet of picking four straight races at once. Luck won on my side from the start, as my first three picks all won. That meant I needed only one more win to take home a few hundred dollars. What’s more, my horse in the fourth race – Fun Up – looked like the only horse that could run a mile and a quarter, let alone win it. My friend Glenn and I immediately started to plan the big party we would have for our friends that night. Sadly, Fun Up settled into the fifth position at the start and had a nice jog around the track. He never threatened the leaders. Talk of the party stopped. Fun Up proved to be no fun at all. Would I go again? Sure. I’ve paid several visits to Fort Erie over the years, and it’s usually been an entertaining day.